Starting with a social work degree, six professionals traveled in various directions to different destinations, ones they often didn't imagine from the outset. There are some professions in which there is a direct line from degree to professional starting point to finish. Teachers, for example, typically teach. Though they may vary in the grade and population they serve (and some may move on to administration), a degree in education most commonly leads to the classroom. At one time, it was largely believed by the public that the same was true of social workers. When Darlyne Bailey, PhD, LISW, a professor and dean emeritus, and director of the Social Justice Initiative at Bryn Mawr College, first started looking into social work, she found that there wasn't a lot known about the field by those who weren't in it. "Everyone had the same image—the woman with the welfare book taking children," she says. In truth, social work was then and is now a much more wide-reaching profession, in which those with social work degrees are able to serve in the capacity that best suits them and their passions. To highlight some of the many paths social workers can take, Social Work Today speaks with six in the field about where they thought their degree would take them when they began and where they are now. Bailey turned toward social work for a practical reason—her then-fiancé asked her to look for a graduate program that required less schooling than her other options. "I can honestly tell you it wasn't totally thought through," she remembers. "I was originally going to go into psychiatry. "But once I discovered social work, I started talking to people about what social workers do. I looked and found that they did exactly what I wanted to do, which was to serve—working with all types of people across all spectrums of life regardless of identities and circumstances—and to work with them in the context of the community." After earning her degree, Bailey worked for several years as a clinician. She worked at an outpatient facility, serving individuals, couples, and families, and helped to set up a community mental health center. "My job was to oversee the intake and crisis intervention unit, which I loved. It [the organization] grew from one county to [serving] more than 100,000 people in just three years," she says. It was while with this organization that Bailey's career started down a new path. She briefly considered medical school—applying to and getting accepted—before learning of a degree in organizational behavior. Bailey attended Case Western Reserve University and shortly after earning her doctorate accepted an assistant professor position there in the social work department. "Three weeks after getting tenure, I became a dean," she says. She describes being a dean as guiding a community, noting that the position can vary from school to school. In all of them, the dean works with the faculty to envision the curriculum, while in a growing number the responsibilities can include significant fundraising and in some even building maintenance. What Bailey enjoyed about being a dean was being able to foster connections. "I've been blessed with seeing connections everywhere—bringing people together, bringing resources together," she says. "I wanted everyone who walked across the threshold to be filled with élan! If you're in an institution, regardless of your position, you're going to be spending a lot of time there. I wanted everyone there to be able to walk in and say 'I'm glad I'm here.'" Today, Bailey holds the title of dean emeritus at Bryn Mawr College School of Social Work, and continues to serve as special assistant to the president for community partnerships, lead the Social Justice Initiative, and cochair the national Special Commission to Advance Macro Practice. In addition, she serves as the Moses Visiting Professor at the Silberman School of Social Work at Hunter College. She was inducted into the NASW-PA Pioneers program in December 2017. An associate professor at the School of Social Policy & Practice at the University of Pennsylvania, Hillier describes herself as she entered into an MSW program as "a reluctant social worker." Having completed her undergraduate degree at the same time as the Los Angeles riots that followed the acquittal of the police officers who brutalized Rodney King, Hillier moved from New England to Washington, DC, where she worked in the welfare office for three years. She then opted to pursue her doctorate by way of the MSW. "The MSW was the most practical and efficient way to move into doctoral coursework. I had no intention of being a front-line social worker and resented having to complete a field placement after having worked with people living in poverty in DC. A product of a liberal arts undergraduate education, I also resisted the professionalization that was a central part of my first-year MSW coursework," she says. While working toward her doctorate, Hillier was introduced to GIS—geographic information systems. "Lights went on in my head," she says, "as my natural ability to think spatially was activated. I never took a GIS course, but with the help of some generous people like Tom [Pederson] at Penn's Cartographic Modeling Lab, I was able to learn basic GIS skills. Some of my first maps were of contemporary complaints of housing discrimination in Philadelphia." GIS is most commonly used to manage and analyze data, allowing professionals the opportunities to recognize patterns and relationships and inform decisions. "It's been used for decades to monitor natural resources, support military actions, and identify the most lucrative location for the next Starbucks or Walmart. Our job," she says of social workers, "is to apply these tools to promote social justice and equity. We—social workers, city planners, public health professionals—ask different kinds of questions; no one else is going to make the maps that we make." Hillier now teaches at Penn and continues to conduct research. She says her identity as a social worker has changed since her early reluctance and likely will again as her career continues to develop. At present, she has begun to focus her research on LGBTQ youth, particularly transgender youth of color—a turn that stems from her raising a transgender daughter of color. "I wanted to use my research skills to generate greater understanding and support for this amazing community," she says. "So in many ways, I'm starting over, developing new skills and knowledge, developing a new team, a new research agenda, and new publication record." For Mary Jo Monahan, CEO of the Association of Social Work Boards (ASWB), the decision to pursue her MSW grew from the experience she had working at St. Rose's Home for Girls, a residential treatment facility in New York for adolescent girls who were in foster care or were deemed runaways. She recalls one specific incident that set her on her path. "One night, I caught one of the girls trying to sneak out from the second-floor balcony—because she made way too much noise! I spent the rest of the night talking her out of running away. She told me she was pregnant and knew she would get kicked out," she says. Monahan sat and talked with the young woman, convincing her to stay and meet with her therapist (an MSW) the next day. It was after this interaction that Monahan knew she wanted to pursue her MSW. She did so without a concrete career plan, knowing only that she wanted to work at the clinical level and have a hand in policy. "I had no idea the wonderful versatility of the degree," she says. From the start and since, Monahan has gained experience in the clinical, macro, and mezzo aspects of social work. She has had what she describes as five careers in the field—a fact that she feels makes her all the more adept and effective as a professional. "I believe that competent social workers work equally well and comfortably in direct practice, policy, and administration, as I have throughout my five careers on one MSW: clinical social worker, social work adjunct educator, macro practitioner (serving in executive leadership positions in for-profit and nonprofit organizations and social work agencies helping to set and administer policy), professional volunteer on nonprofit boards, and regulator." Monahan describes the mission of ASWB as "strengthening protection of the public by providing support and services to the social work regulatory community to advance safe, competent, and ethical practices." As the CEO, she is responsible for the organization, ensuring its mission and values are achieved and maintained through strategic goals, effective communication, and administrative and fiscal management. Monahan believes that this position draws on her clinical and macro skills as a social worker every day and that these skills enable her to be the CEO she strives to be. "Both sets of skills are necessary for me to be successful as the CEO and for ASWB to continue to thrive. These skill sets complement each other and I believe help me to function strategically with a future-oriented, anticipatory focus for ASWB and for the social work profession," she says. Frederic G. Reamer, a professor at the Rhode Island College School of Social Work, entered the field planning to work in the criminal justice system." At the front end, I figured I would work in prisons. I would work in criminal justice and then over time have an academic career. I would do what academics do," he says. He did in fact do those things. Reamer has worked in correctional and mental health facilities and has been a professor at Rhode Island College since 1983. He has dedicated much of his career to social work ethics, chairing the NASW Task Force that wrote the NASW Code of Ethics. However, he has also held positions that he never would have predicted. After chairing a commission for the then governor of Rhode Island, Reamer was asked to join the governor's staff. "I ended up having a part-time leave of absence from my professor position and was senior policy advisor to the governor of Rhode Island," he says. Reamer worked on Governor Edward D. DiPrete's staff for three years. "My focus was on public policy issues," he adds. He also served as the commissioner of the Rhode Island Housing and Mortgage Finance Corporation and, in 1992, was appointed to the state parole board. In Rhode Island, the parole board consists of seven members, one of which must be a social worker or professional from a closely aligned field, Reamer says. The parole board convenes to determine whether an individual should be granted parole and released from prison. The board may hear not only from the inmate but also from the victim of the crime. "We consider a range of factors: the seriousness of the crime, criminal record, what kinds of programs the inmate enrolled in during their sentence, did they demonstrate any insight about their conduct, the factors that contributed to their conduct, [and] what steps they are likely to take to prevent recidivism," Reamer says, adding that behavior while in prison is also considered. In his 24 years on the parole board, Reamer believes that his social work perspective was his most valuable asset and contribution. "I always looked at these very complex cases and inmates' lives through a social work lens, not just in regard to the behavior but also what they would likely need once released from prison," he says. Reamer recently stepped down from the parole board having presided over an estimated 25,000 hearings. He now teaches at the Providence, RI, police academy and continues at Rhode Island College. He also recently wrote the book On the Parole Board: Reflections on Crime, Punishment, Redemptions, and Justice. Of his career, Reamer says he has no regrets. "I'm actually more convinced now than I was then," he says referring to when he entered social work. "It was exactly the right choice." A self-described gamer, Kenneth Scott Smith, director of the Virtual Reality and Technology Lab and an associate professor at Texas State University School of Social Work, has found a path that truly blends his passion for technology with his passion for the helping profession. Like many, Smith first considered pursuing psychology, recalling that "as a 20-year-old, you're trying to find some kind of path that feels good, that fits. I started in psychology, and the ideology didn't match mine." He found that social work did. "It's a way of life," he says. "It's way more than just helping others and having the skill set to do so. It's a way of being. It's a space for where people who don't have a voice should have one." After earning his degree, Smith worked as a clinician for several years building up a sizable clinical practice. He worked with adolescents, those struggling with substance use, families, and those experiencing trauma, homelessness, and/or domestic violence. When a move took him from Dallas to Austin, TX, Smith joined the staff at Texas State University. There, he saw a need and an opportunity. Virtual reality labs were becoming more established, and as an addictions specialist, Smith believed that such a lab could greatly benefit those struggling with substance use. He developed the Virtual Reality and Technology Lab at Texas State. "We develop, design, research, and create new methodologies to enhance human performance," he says. The lab offers an opportunity for individuals—professionals and clients—to practice skills in a way they could not otherwise. For those struggling with PTSD, for example, "The virtual reality will allow the individual to be exposed to various levels of anxiety and practice mindfulness and coping skills." Similarly, for those struggling with substance use, the virtual reality places the individual in a seemingly real-life experience rather than a role-played scenario. "Taking a person who is struggling with addiction and who has just recently been released from a facility to a bar to practice would be unethical and problematic," he says. "[But] people in role playing or cognitive thought or imagery really don't get the stimuli that can be found in these places." The lab employs both virtual and augmented reality and offers opportunities to professionals such as first responders as well. In addition to his work at Texas State, Smith is starting a business that will offer development and design services for virtual reality and for evaluating virtual and augmented reality. Currently a clinical social worker at Rush University Medical Center, Turner admits that his understanding of social work was limited prior to entering the field. "I got my undergrad degree in psychology, and I thought I was going to get my PsyD," he says. "I always wanted to be a therapist and clinician." Turner remembers sitting down with a professor to discuss his career and having that professor encourage him to look into social work. He found that social work was exactly what he wanted to do and, after gaining some experience postundergrad at a group home, "I fell in love with the helping profession," he recalls. "I liked the ability to sit down with people and have genuine and real conversations," he says. "I was seeing how important context was for treating the person." Turner pursued social work, taking a track that would allow him to earn his CADC (Certified Alcohol and Drug Abuse Counselor). After graduation, he worked for five years with individuals with co-occurring disorders. However, he found that he lacked the training/experience he believed necessary to best treat his clients. "I had seen a lot of trauma in the substance use field, but I had no idea how to treat trauma," Turner says. He notes that in social work schools a great deal of focus is given to trauma-informed care but not necessarily to trauma treatment. For Turner, trauma-informed care focuses more on how the clinician approaches and works with the individual. Aspects of this include treating the client with respect and creating a safe space. Learning how to provide such care, however, does not necessarily teach the clinician how to focus on and address the trauma itself. Turner believes that a combination of trauma-informed care and trauma-focused treatment is needed for quality service. He now works at Rush University Medical Center at the Center for Veterans and Their Families. The center enabled Turner to get the training in trauma he sought. Serving veterans and their family members, he addresses a wide range of issues, from substance use to PTSD to transitions home. Turner says that "substance use and PTSD oftentimes go hand in hand. It's this thing that just keeps feeding itself. A person gets sober, and their trauma symptoms increase. It vacillates back and forth. [You] need to treat both simultaneously." Though significant media attention has been given to the rise of opioid addiction, Turner notes that alcohol remains the most prevalent substance used at the center. In addition to his work at Rush, Turner is a professor at the University of Chicago and does significant work in mindfulness, having cowritten a curriculum called Mindfulness-Based Sobriety in 2014. 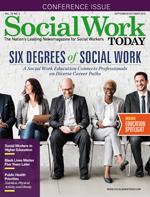 Each of the social workers in this article entered the field with different levels of knowledge about the profession and with different goals in mind. Thanks to their dedication to social work, their determination, and their openness to next steps, each found paths they could not have envisioned from the onset. Degrees in social work enabled them to explore not only clinical settings but also academia, criminal justice, virtual reality, and much more. There is no question that their paths will continue to wind through the possibilities of the field. The same can and will be true for social workers just now beginning their professional lives. The key, Reamer says, is to "Keep your antennae up." "So many social workers—so many professionals—have a linear plan for their professional lives, but 1) Life is rarely linear; [and] 2) The fact that it's so curvilinear is inevitable and kind of exciting," he adds. Who knows where a social work degree can lead next?